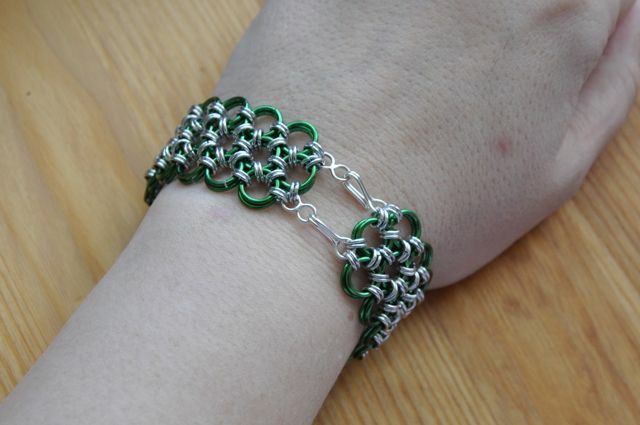 This is a very time-consuming design, but fantastic to wear, it feels smooth and slippery and it rattles ever so slightly when you move your wrist. It’s also very flexible, it rolls up into a small roll. 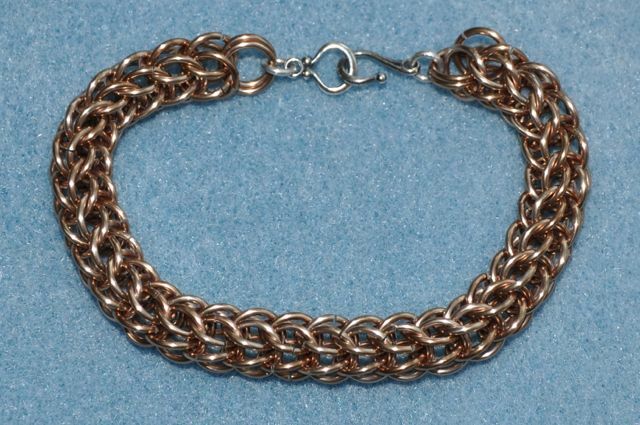 I closed it with a pair of sterling hook clasps and made it only slightly longer around than my wrist. I also made a hexagon of Japanese lace using rubber rings as the larger ring and it’s fantastic as a flat stress ball, or possibly a waterproof coaster. It’s one of those desktop things you can pick up and fiddle with. This one is a little more chunky than I was expecting, more so in contrast to the very flat Japanese Lace, but I love the bronze/caramel colour of the rings. It’s a fiddly weave to start, but I like the finished look. I’ve made all the weaves from my Basic Chainmail book now, and a couple from the Advanced Chainmail book. I have a few more designs I want to learn and lots more things to make.